Marco Tozzi’s patent navy espadrille wedges will become your shoedrobe staple this season! The patent upper adds the glam factor and the soft pointed toe gives an elegant shape to this gorgeous shoe. They’ve used their padded ‘feel me’ technology for the insole to give a soft, extra comfortable feeling for the underneath of your foot. 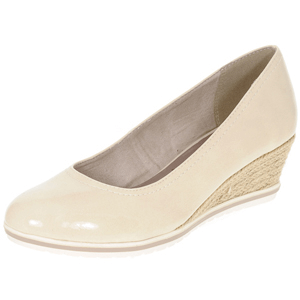 The roped wedge is a flattering 7.5cms including the sole. Wear with anything and everything!